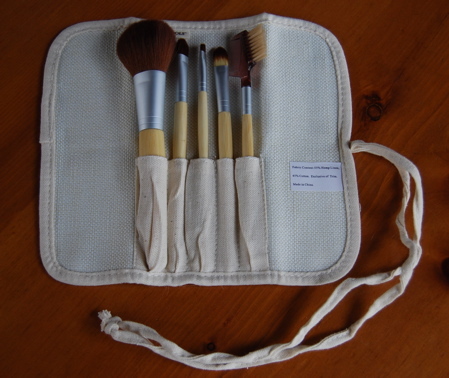 Cruelty-free, bamboo handles, *ferrules made from recycled aluminum, and a case made of cotton and hemp. 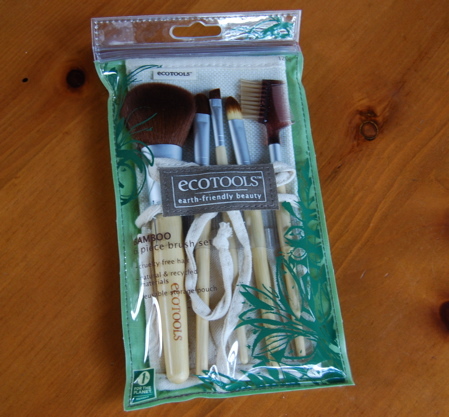 EcoTools just might make the ideal green brush set. But the real question is: How do they perform? Exceptionally well! The Blush Brush is so soft and fluffy that it feels like a beauty treatment just swiping it across your cheeks. I prefer to use it for lighter pigmented blushes as darker ones can go on a bit heavy handed unless you’re careful, and I always seem to be in rush. The Eyeliner Brush is also a standout as it works well for both gel eyeliners and mineral shadows. The Eye Shading Brush (just left of the eyeliner brush in the middle) is nice, but it’s on the stiff side which makes it better for cream rather than powder shadows. I love using it with my RMS Beauty cream shadow in Seduce. It doesn’t pick up a lot of color which is fine by me as I tend towards a natural look when I do wear eyeshadow. The Concealer Brush (to the right of the eyeliner brush) is soft, dense and perfectly tapered for the job. And what can I say about the Lash & Brow Grooming Brush? I’m not a expert on brows, so it seems as good as any other. For $12.99, this set is a terrific buy, and I highly recommend it. It’s available at Nature of Beauty, and word on the street is Target carries the set as well. * Ferrules are the metal part that keeps the brush intact, I just learned that myself. Disclosure: Nature of Beauty sent me the set for review. The opinons in this review are my own. I was not financially compensated for this review or any other. 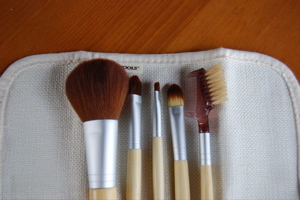 I love this brush set too! The blush brush is the nicest/softest I’ve ever found! I had to stop using my Bare Minerals brush after using this one because it was so rough in comparison.